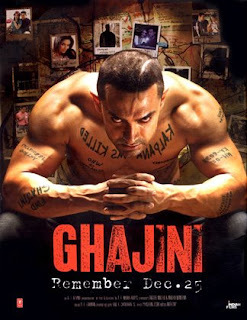 Ghajini (Hindi: घजिनि) is a 2008 Bollywood film directed by A. R. Murugadoss and produced under the Geetha Arts. The film, is a remake of the Tamil film, of the same name, which was also by Murugadoss. That film, in turn, was inspired by Christopher Nolan's film Memento. It stars Aamir Khan and Asin Thottumkal in the lead roles while Jiah Khan, Pradeep Rawat and Riyaz Khan essay supporting roles. This Film Music Scores are Done by A.R.Rahman Aamir khan spent 1 year at the gym, continuously training with his personal trainer for the role. The movie is an action-thriller, with strong romantic elements, that explores the life of a rich businessman who suffers from anterograde amnesia following a violent encounter in which his love interest, model Kalpana was killed. He tries to avenge the killing with the aid of Polaroid Instant camera photographs and permanent tattoos on his torso. The character of Aamir Khan will also feature in a 3-D game titled Ghajini the game, which is based on the movie.